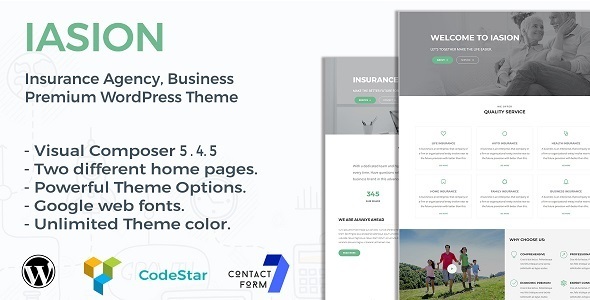 Iasion is a professional Theme creatively crafted for Insurance agency,consultancy, Business Company.With its quality sections any one can build a professional look website for his or company. Iasion comes with two different home concept with creative and professional look.It has several service page along with faq page, just needed by any professional business company. Fast, intuitive and smart page builder will make your customization fast and easy. With our 15 custom add-on of visual composer, you can easily build web page of your site. Iasion is ready to use from the box. Install Iasion with powerful one click installer. Get your site up and running in no time! Quick, easy and super fast. Iasion comes with number of google fonts.Choose any of the Google web fonts library.You can easily set website body and heading font from theme options. Look of your website on mobile devices is very important these days. So we made sure Iasion looks great both on mobile, desktop and retina screens! Set your favourite theme color from theme options easily. Enjoy unlimited theme color. Iasion is compatible with the most powerful and most popular custom contact forms WordPress widget! create your own forms in seconds! Iasion is based on most popular, light well used, powerful codestar framework. Extensive documentation with related screenshots, on how to setup and customize the site will make your work super easy and fast! Iasion looks great among all major browsers including IE9+. Please Note:Images and icons are demo purpose only,they are not included in the download package.